Stars made from bent glass tubes like neon signs by designer Pernilla Ohrstedt illuminate the Christmas tree at the Edition hotel in London. Pernilla Ohrstedt created the glass ornaments to decorate the fir tree in the lobby of the London Edition. "This is the first time that Edition has done a Christmas tree so they wanted to do something really different," Ohrstedt told Dezeen. She created sixteen stars each bent from one eight-millimetre-diameter glass tube. Their pointed three-dimensional forms appear different from various angles. The tubes are filled with argon, a Noble gas similar to neon, which gives off a blue light when electricity is passed through. "I wanted to contrast the 60-year-old tree with something really contemporary and the argon feels really radical," said Ohrstedt. "One of the most successful elements of Edition is the lighting. The blue is so radically different that it contrasts and compliments the space." Ohrstedt worked with argon and neon sign specialist Nick Malyon to form the stars in his workshop. "Neon signage is a real cottage industry," Ohrstedt commented. "All you need is the gas, a glass and a flame, but also a lot of skill." The twenty-foot tree and its stars will be displayed in the hotel lobby until the new year. Elsewhere in London, baubles designed by celebrities including Zaha Hadid, Gwyneth Paltrow and Mary J Blige are on display in The Shard until they are auctioned off this weekend. Photographs are by Jamie Smith. The London Edition is delighted to unveil its first Christmas tree, designed by Swedish designer Pernilla Ohrstedt in collaboration with Nikki Tibbles. 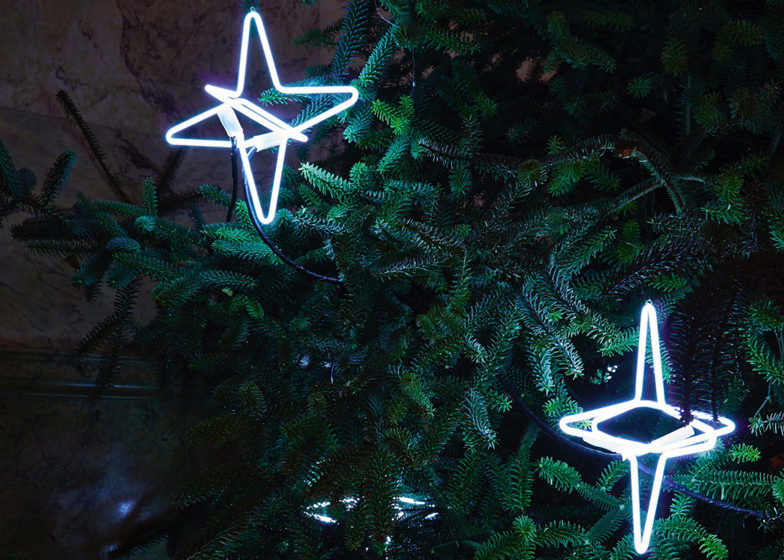 The giant 20-foot pine tree (Abies Nordmanniana) features 16 bespoke three-dimensional argon-filled stars created by Ohrstedt exclusively for Edition. With its simple yet elegant design the tree blends perfectly with Edition's sophisticated design sensibility. The delicately bent glass stars, produced by Nick Malyon, are lit by argon gas to produce a silver blue line of light. As you move around the tree the stars gradually change their appearance and light. "The London Edition is both classic and cool and the 60-year-old living tree lit purely by Argon stars embodies just that," commented Pernilla. Pernilla's previous works include Coca-Cola's pavilion for the London 2012 Olympic Park, set design for Topshop and Antipodium and window displays for Colette. Nikki Tibbles commented: "The brief from Ian Schrager was 'Traditional with a modern twist'. I'm absolutely delighted with the finished design. Its traditional meets modern art at its best. It has been an absolute pleasure working with Pernilla whose Argon Stars are simply mesmerising. From having worked with Ian Schrager for over 15 years, it is the first time ever installing Christmas in any of his hotels, which makes this collaboration even more special." The Christmas tree will be on display in the lobby until the New Year.